Roxanne Donovan, Kennesaw State University. I’ve actually heard these statements from people pained by Donald Trump’s election. Such sentiments convey a mix of disbelief, despondency, powerlessness and fear. That said, there are many people who are thrilled with the new administration. As a psychologist who researches the ways discrimination experiences impact well-being, however, I am particularly sensitive to those in distress. 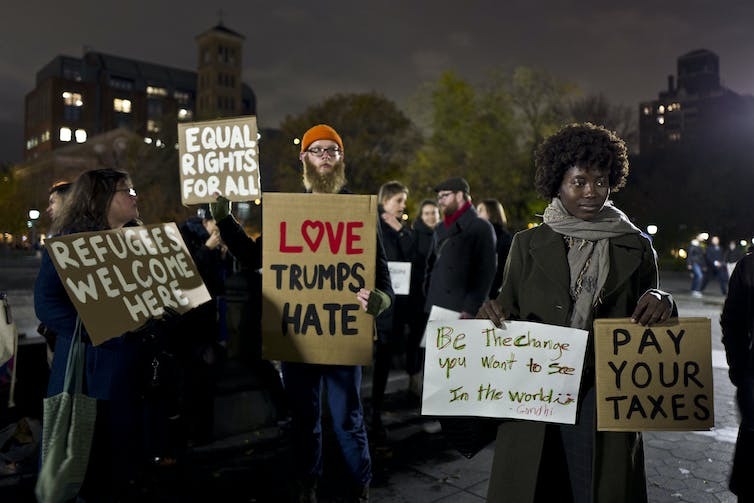 My research, and that of other social scientists, helps explain why a Trump presidency is difficult for so many people – and particularly acute for those who have already experienced trauma based on some of the issues identified with Trump. For example, many women who have been sexually abused were deeply affected because of recorded statements he had made about grabbing women in their crotches. Additionally, many African-Americans who felt empowered and validated by an Obama presidency felt deep sorrow and fear at Trump’s election, due in part to published accounts of his father’s company not renting to African-Americans. There is some good news among all this; there are strategies for coping. It has proven hard for those opposed to Trump to adjust to his election. Many have felt like they are in the middle of an ongoing stress storm. Immigrants, for example, are stressed over concerns about being deported and separated from their families. Making matters worse, some are more vulnerable to this storm’s impact than others. The more storms a person has endured, the greater the damage this new storm can inflict. The reason why this happens is called allostatic load – the wear and tear on the body caused by ongoing stress. This deterioration is cumulative and can lead to physical, psychological and cognitive declines, including early death. Along with genetics, environment and behavior, social demographics like race, gender and age also influence the weight of the load. University of Michigan public health professor Arline Geronimus and her colleagues captured this phenomenon when they examined allostatic load in black and white women and men. They found that black participants, particularly black women, were more likely to have higher allostatic loads than white women and white men, above and beyond the effects of poverty. In other words, black people generally carried more stress in their daily lives. Age matters too. Allostatic loads were similarly distributed across race and gender prior to age 30. From there, however, the loads disproportionately increased with age, revealing racial and gender gaps that widened over time (white men consistently had the lowest scores, followed closely by white women). Some psychologists believe the stress of otherness – being viewed and treated negatively due to group membership – is one reason for the unequal “weathering” effect. Mounting evidence gives credence to this belief. My research group, for example, found black, Latino and Asian undergraduates report significantly more individual and ethnic-group discrimination than white undergraduates. Similarly, almost 100 percent of the black college women my collaborators and I sampled reported experiencing racial discrimination. In both studies, incidences of discrimination were associated with depressive symptoms and, in some cases, anxiety. So the interplay between high allostatic load and low social position increases vulnerability. This is not good news for the many people of color, women, undocumented immigrants, sexual minorities and Muslims who are stressed out about a Trump presidency. Before giving in to despair, there are reasons for cautious optimism. Psychological research points to promising coping techniques shown to lighten allostatic load and mitigate negative stress outcomes, even among those exposed to prolonged high-stress situations. Avoid avoidance. As tempting as it might be to address negative feelings through avoidance – think excessive shopping, working, drinking, eating, gaming, online surfing – doing so can be detrimental in the long run. Instead, choose behaviors shown to improve mood over time, like exercise and meditation. Mindfulness-Based Stress Reduction (MBSR), a standardized eight-week program that teaches mindful meditation, shows great promise at reducing stress and improving mood in a wide variety of populations. Problem-solve. Taking action to address a perceived stressor can be therapeutic. Called problem-focused coping in the psychological literature, this technique has been shown in my research and that of other social scientists to buffer the negative health effects of stress. Donating time or money to a preferred political candidate, party or cause or participating in a protest or letter-writing campaign are examples of problem-focused actions. Seek support. An aspect of problem-focused coping worthy of individual attention is social support. Connecting with empathetic others has the interrelated benefits of reduced stress, lower allostatic load and improved health and well-being. A solid support network doesn’t have to be large. It can contain just a few people you perceive as reliable. Need to build your network? Start by reaching out to those already in your life that you’d like to know better. Joining civic organizations or neighborhood groups are also good options. If you go this route, facilitate connections by volunteering to help the organizers. Get help. Sometimes our coping efforts don’t yield desired results, or we can’t bring ourselves to try anything. In these situations, professional help might be warranted. The American Psychological Association is a great resource for information about the benefits of psychotherapy and how to go about finding a therapist. If you plan to endure the social changes under way with gritted teeth and clenched fists, I invite you to experiment with the above techniques to find what combination might work for you. Four years is a long time to be battered by a storm; preparation could mean a lot less damage, especially if previous storms have worn you down.